Broad money velocity in the U.S. is collapsing at the fastest rate since the end of the 2007-2009 recession. In other words, the recent pickup in broad money in the U.S. looks like a dash for risk-free cash assets, which also occurred in 2008 and 2001 as velocity collapsed. Widening credit spreads, a collapsing term structure and flat bank credit also are consistent with low/falling velocity. 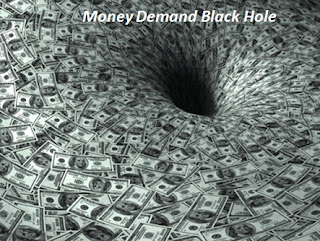 In more graphic terms, the recent spate of bad economics news coming from the U.S. and Europe is ramping up the money demand black hole as investors rush back into money and money-like assets. Velocity is dropping fast because of this spike in money demand and, as a result, current and expected current dollar spending is falling too. 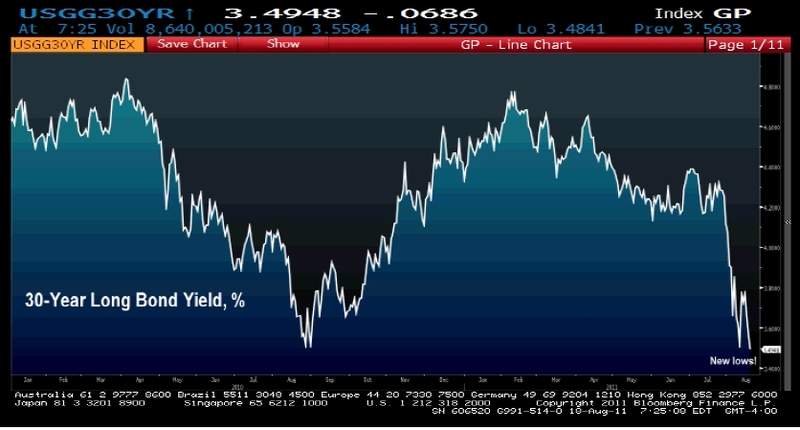 This is, in turn, is causing the economic outlook to decline and is the development to which long-term yields are responding. Ideally, the Fed would respond to the money demand black hole in a systematic, predictable manner that would bring certainty to the market. 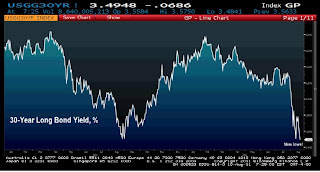 Unfortunately, the Fed is not doing that and continues to allow a passive tightening on monetary policy.